Derek Smith has taken a roundabout route to becoming an everyday player in the National Hockey League with the Calgary Flames. After spending four years in the Ottawa Senators’ organization, Smith decided to sign with the Calgary Flames as a free agent on July 12 and he hasn’t looked back. Smith cracked the Flames’ lineup out of training camp and the 6-foot-1, 197-pound defenceman has fit in nicely on the Calgary blue-line. After playing 123 games over four seasons between 2000 and 2004 for the Wellington Dukes of the Ontario Provincial Junior Hockey League, Smith went on to play three more seasons for the Lake Superior State Lakers. Although he was undrafted, Smith signed as a free agent with the Senators in April of 2007 and decided to leave college a year early to pursue his dreams of playing in the NHL. Early in his first season with the Binghamton Senators of the American Hockey League, Smith received a wake-up call that has stuck with him to this day. Smith was sent to the Elmira Jackals of the ECHL, but after recording an assist in his lone game he was summoned back up to play with Binghamton once again. “It was definitely an eye opener, that’s for sure,” said Smith, who took it as a sign to become a better two-way defenceman. “It was just like, ‘I better start concentrating’.” For four seasons, Smith served as a steady blue-liner for the Binghamton Senators. He played two games with Ottawa in the 2009-10 season and nine more with the NHL Sens last year. He even recorded his first NHL point when he drew an assist on a goal by Nick Foligno in a game against the Atlanta Thrashers. Last season with Binghamton, Smith scored 10 goals and added 44 assists in 71 regular-season games and then added a goal and an assist in six playoff contests as the Senators marched all the way towards a Calder Cup championship. The B-Sens overcame a 2-1 deficit to beat the Houston Aeros in six games in the AHL finals. While he took a less traditional route to the NHL than other players, Smith has learned something at every step along the way that has helped him become a better player. 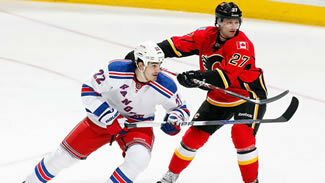 Through his first 24 games with the Flames, Smith counted his first two NHL goals to go with four assists. While he enjoyed his years in the Ottawa Senators’ organization, Smith is definitely happy with his decision to head west to join the Flames.